Use a heavy-duty pan with a light-color surface, which will make it easy to monitor the color of the caramel as it darkens. Nonstick or other pans with dark finishes make it difficult to see what’s going on. In a small bowl, mix the fish sauce and 1/4 cup water. In another small bowl, mix the shallots, garlic, red pepper flakes, and 1/2 tsp. black pepper. Put the sugar and 2 Tbs. water in a 10-inch straight-sided sauté pan over medium heat and cook, swirling the pan occasionally, until the sugar dissolves. Let the melted sugar come to a boil and cook, swirling the pan occasionally at first and more frequently as the sugar browns, until it has caramelized to a deep amber color, 5 to 8 minutes. Remove the pan from the heat and, standing back to avoid spatters, slowly add the fish sauce mixture to the pan. Swirl the pan to combine, return to medium heat, and bring to a boil. Add the shallot mixture and continue to cook, stirring occasionally, until the shallots soften, 1 to 2 minutes. 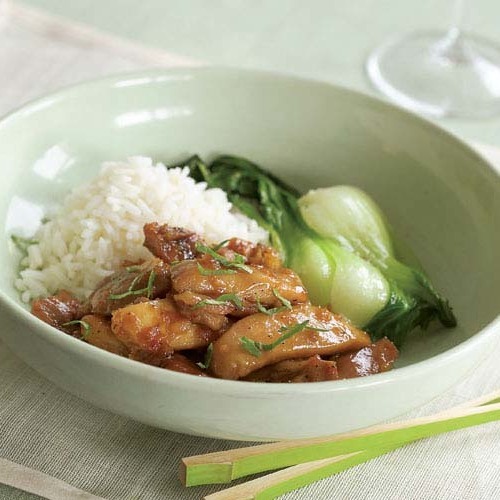 Add the chicken pieces to the pan in a single layer, reduce the heat to medium low or low, cover, and cook at a gentle simmer, stirring occasionally, until the chicken is cooked through, 8 to 10 minutes. Serve sprinkled with the cilantro. 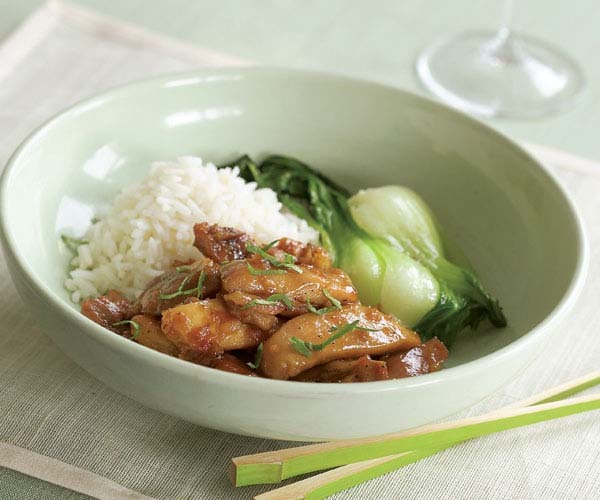 Jasmine rice and stir-fried cabbage or baby bok choy make great accompaniments. Excellent dish - easy to make on a weeknight and all my guests love it each time I prepare it! Sweet and very delicious! Not too long to make - I'll do this one again. I must agree, the smell from adding the fish sauce to the caramelized sugar was extremely unpleasant. Further, the family teens did not like the taste imparted upon the chicken from the fish sauce concoction. I have to admit that I liked the flavor of the finished dish. But I could not get past the smell of the fish sauce when it hit the hot caramel, so I doubt I'll ever make it again.p.s. That photo doesn't look like cilantro. Does it?